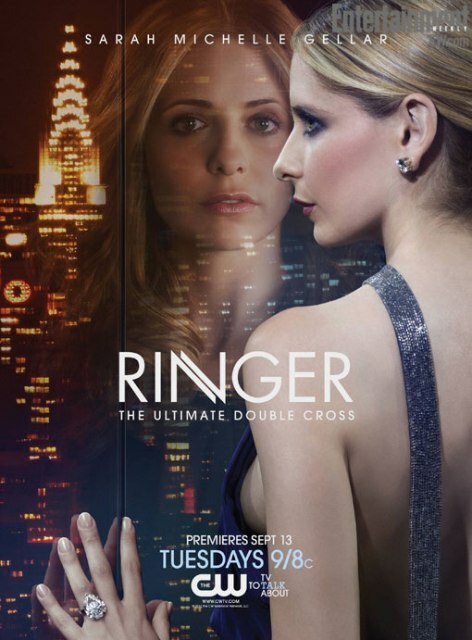 The genre crowd is abuzz regarding the news that our beloved “Slayer,” Sarah Michelle Gellar, will be returning to commercial television – both acting as well as serving as executive producer for a new Fall series titled “Ringer.” Gellar plays a woman on the run who conceals herself via the identity of her wealthy twin sister. I am a fan of Gellar and absolutely wish her all the best and will definitely check out the new show despite having mixed feelings. The problem is simple; I, along with a large majority of my geek brothers and sisters, will forever see her as “Buffy the Vampire Slayer” and have little desire to do otherwise. Even as a horror fan, I’ve had some difficulty watching her in the various film roles she’s taken on since the hit series ended. The sight of her running in terror messes with my sensibilities and I keep waiting for her to stop, face her opponent, and deliver a well-placed drop-kick that sends her adversary soaring across the room! Sarah Michelle Gellar is an amazing actress and I am not trying to imply that she’s been typecast so much as suggesting the void left from her Buffy character has yet to be filled. In my lifetime, I have loved very few series and was never much good at “appointment TV” (though it has gotten a lot better since the advent of DVR’s). Needless to say, “Buffy” wasn’t an easy sell. I remember it was the late 90’s and I was just getting used to the idea that “The X-Files” was over (even though it was still airing, if you catch my meaning). I had heard about “Buffy,” thought it sounded silly and destined for mid season cancellation. I had sat through the Kristy Swanson film and considered it 86 minutes of my life I’d never get back and had no interest in wasting any more of my time. I started watching somewhere in the middle of its third season and, by its rip-roaring finale, was completely hooked. Later I began working at Chicago’s Brookfield Zoo and a strong majority of my co-workers were Buffy fanatics like me.Every Wednesday the Nyani (Baboon) lounge was dominated by conversations regarding the previous night’s episode. Tuesday nights couldn’t come fast enough and my X-Files posters were slowly replaced with images of the Slayer instead. At a surface glance, the show did indeed look silly. You’ve got an attractive teenaged girl who discovers she’s the “The Chosen One” and that it is her birth-rite to do battle with vampires, demons, and a host of other nasties unleashed via the mouth of Hell. Similar to a Marvel comic hero (particularly Spider-man), she often found her job as the town hero in direct opposition with her personal life. The famous “with great power comes great responsibility” mantra was ever present with Buffy. There was, however, a lot more to Buffy than mere action/heroics. 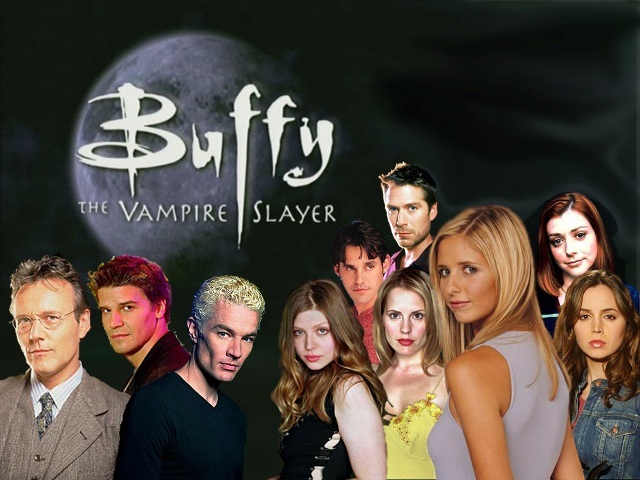 “Buffy the Vampire Slayer” is simply one of the most brilliant series ever to grace the small screen. You may think that this is a bold statement or simply the mad ramblings of a super dork. You’d probably be right on both counts, however, that doesn’t make what I’ve said any less true. “Buffy” boasted some of the wittiest dialogue, clever stories, and endearing characters I’ve seen to date. Creator, Joss Whedon, brought together a group of teens who talked like thirty year olds while battling the forces of darkness amidst figuring out who their dates will be for Prom. This group was anything but the shallow eye candy seen in most teen shows, such as their 90210 neighbors to the south. Many of us middle-aged folks look back fondly at our High School years and fantasize about reliving our “glory days.” I know I do every time I look in the mirror and notice hair growing everywhere but on my head, while experiencing aches and pains in muscles I didn’t even now I had. “Buffy” reminds us that despite the vim and vigor, those “good old days” were, in many ways, the MOST difficult period of our lives. Our bodies are changing, we’re caught between being kids and adults, and begin to question our parents as we become convinced that we now have all the answers. Peer acceptance becomes the most important thing and we desperately try to “fit in” at a time when we’re supposed to be discovering who “we” are. “Buffy” managed to capture the very real “Hell” of adolescence via the fictional Hell she fought. Physical demons and monsters were often created as metaphors for the complex issues many teens (super powered or not) must deal with on the road to maturity. In this, despite the presence of magic and monsters, “Buffy the Vampire Slayer” set itself far above most “normal” dramas. Long before TWILIGHT would captivate the teen crowds of today, Buffy had already addressed the story of a girl in love with an attractive, brooding vampire. The early seasons of Buffy dealt with her tumultuous relationship with Angel, a vampire with a “soul,” who would later go on to head his own successful spin-off series. Other shows have also used this theme such as TRUE BLOOD and THE VAMPIRE DIARIES. There is a reason that this formula is so popular, especially with the younger set. Its a fictional way of dealing with the very real phenomena of being attracted to the “bad boy” as most of the good looking gals tend to be. In my opinion, Buffy did the best job at not only handling this theme but reminding us how painful our first loves were. We never know it at the time but, years later, most of us will breathe a sigh of relief that we didn’t end up with those people. Sort of like that old country song about taking the time to thank God for all those “unanswered prayers” – most of which are made during our teen years. Unlike a few of the aforementioned vampire shows, Buffy was far from a one trick pony. Angel left Sunnydale by the fourth season and Buffy was left to deal with other issues such as loss of a loved one, insecurity, addiction (via her witch friend, Willow, who finds she’s “using” magic a bit too much), the college experience, and entering the work force. All this while working with her “Scooby gang” at stopping the latest potential Apocalypse. The series ended with a bang (literally) and now lives on via comic books. There we can see all of our favorite characters (looking just like the actors who played them) continuing to crack dry jokes while stopping the next “big bad.” This still can not fill the giant hole that’s been left since Buffy left TV. Sarah Michelle Gellar is a fine actress and will, no doubt, continue adding great work to her resume.’ I just feel that, until one of those new “activated” slayers from the series finale gets their own series, we will continuously look to her as the Chosen One. This entry was posted in Misc Mayhem and tagged Angel, Buffy the Vampire Slayer, Joss Whedon, Ringer, Sarah Michelle Gellar, Spike, The Scooby Gang, vampire, X-Files. Bookmark the permalink. ← SPACE BATTLESHIP YAMATO: THE FINAL BATTLE – So Worth The Wait! Thanks, Sabrina! I’m crying for Buffy to return as well – that was a void never filled!